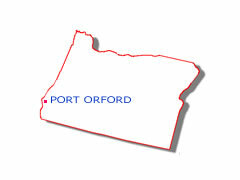 The tiny city of Port Orford (pop 1000+) has a couple of claims to fame: its the first white settlement on the Oregon Coast and it is also said to be the most westerly incorporated town in the continental U.S. Located on the southern Oregon coast 27 miles north of Gold Beach, Port Orford has a long history as a fishing and lumber port. Fishing boats can't be moored in the harbor due to the lack of protection from southerly winds. So, they are hoisted out of the water each day on a converted log boom. The first settlers came to log the aromatic white cedar which is also known as the Port Orford Cedar. Battle Rock dominates the waterfront views. This was the site of an historic skirmish between the first landing party of settlers and local native Americans. This battle is reenacted each 4th of July. A 3 mile hike to the top of Humbug Mountain is worth the effort for the spectacular views of the Oregon coast from the summit. 5 miles north of Port Orford is Cape Blanco State Park, with camping, a restored ranch, hiking trails, beaches and the beautiful Cape Blanco Lighthouse. Other historical sites include the Hughes House and the Port Orford Lifeboat Station. The Elk and Sixes rivers, are both famous for their salmon and steelhead fishing and are nationally designated wild and scenic rivers. Recreational opportunities are abundant in this coastal community. Beachcombing, whale watching, boating, fishing, clamming, crabbing, hiking, bird watching, surfing and scuba diving are all popular activities.